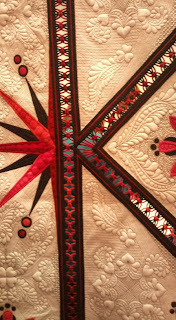 As sweet as cinnamon: Amazing Quilter...beware long post. 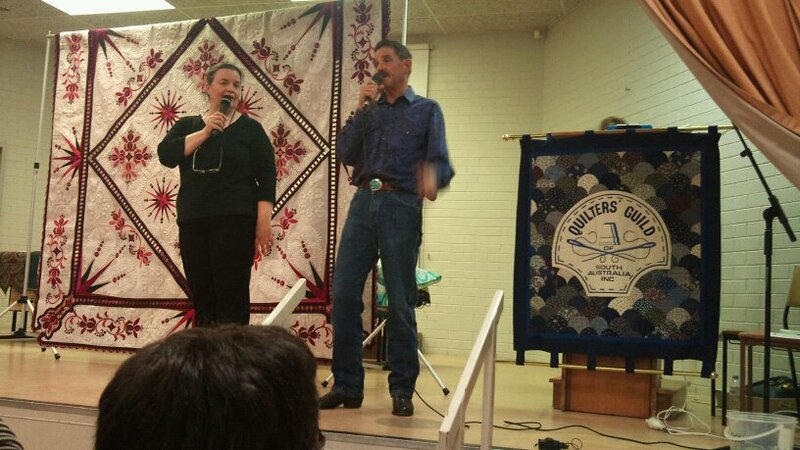 at the Quilters Guild of South Australia, Burnside SA. WOW oh WOW oh WOW... I was gobsmacked. 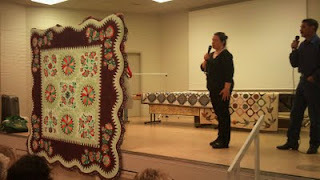 with the quilts and see her amazing stitches. with her husband Gene (hope that's the correct spelling). 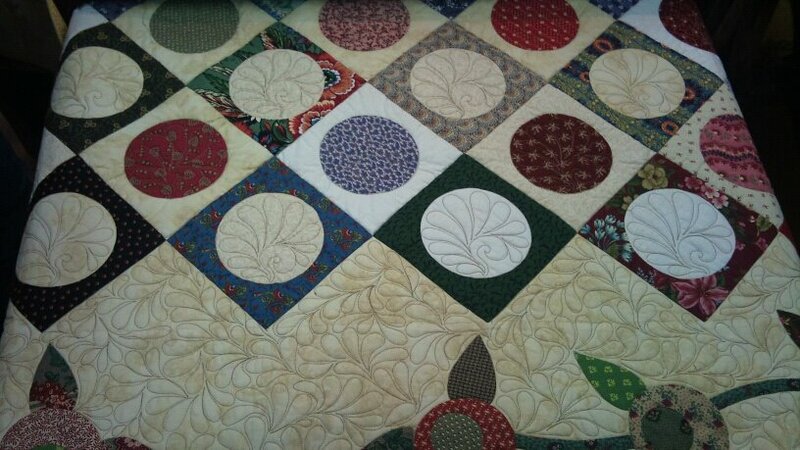 and such an effort, shame about the first quilt. 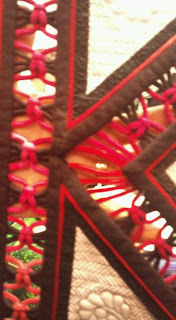 Here it is close up...amazing...black stitching on white. K for Khristina... thinking of you. What did I glean for Sharon's advice and chat. 1. Take as much care with each item as required to make you satisfied. 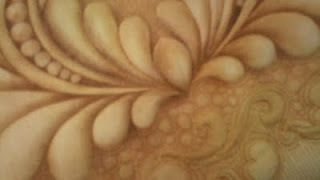 2 Explore other mediums with each new project. 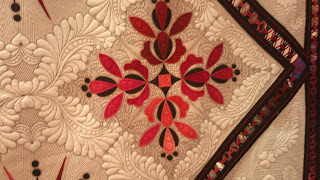 eg: silk threads, beads and piping. 3. Every persons project is a work of art to them. Appreciate it with them even if I don't like the design or color! They love it and are so very proud of their work. as I can to learn new techniques. washed once and hung on the line to dry....yep got that! and repeated this last step 3 times. The higher the count the softer and more pliable the fabric. Don't we all love 12,000 count sheets on our bed to sleep within. Like sleeping among silk, nice and soft and luxurious. That's what our fabric will feel like to sew with. 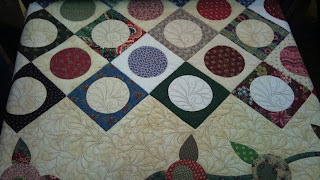 Next time I needle turn applique I am going to try this. Hope you've liked being part of the trunk show too. Off to sew as my machine is back and waiting for me to play. That's not just quilting, it's FINE ART!!! Thank you so much for this post. Amazing quilts. Sounds like a pretty humbling experience!! What exquisite work. Truly inspirational. Oh! Thank you for sharing! Those quilts are amazing! 22 stitches to an inch?! I have a lot of practice ahead of me. Thanks for sharing the show and all of the great tips you learned. A little birdie told us it was a special day for you today, Happy Birthday! Hope you have a great day! 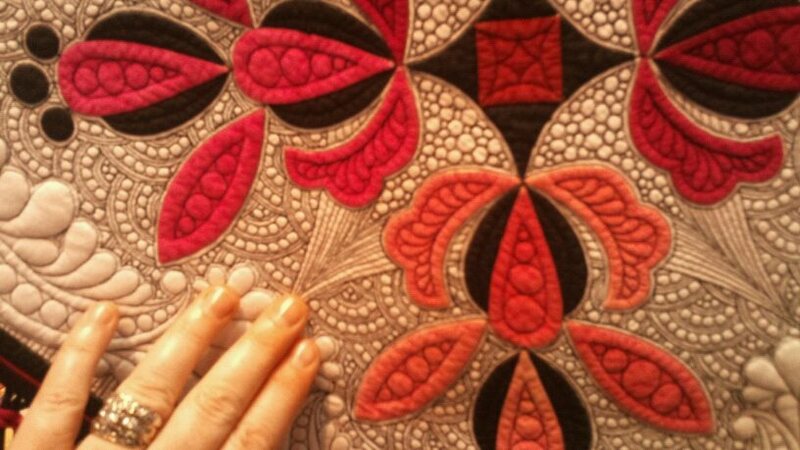 Oh my those are some amazing quilts.. quite inspirational, and maybe someday I will be able to try something special like that. I'll start with a pillow, and work my way up. You never know til you try! I'm saying WoW oh Wow right along with you. 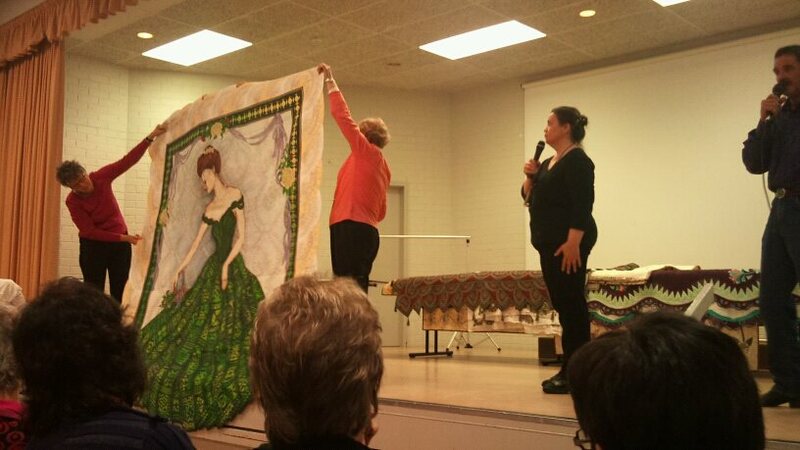 Those are amazing quilts. Thanks for sharing the tips too! WOW. Happy Birthday. 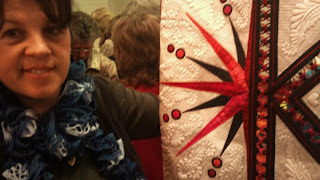 Sharon's quilts are amazing-what a great night for you. Thanks for the tips. A very talented quilter. thanks for sharing. WOW is right!!! Amazing, and what a way to spend your birthday! Lucky you, Dawn!!! 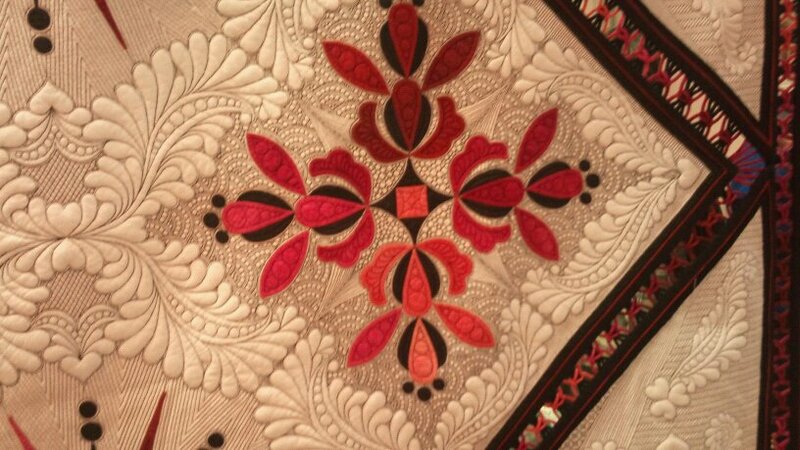 I have seen Sharon's quilt somewhere once before, it is truly breath taking! 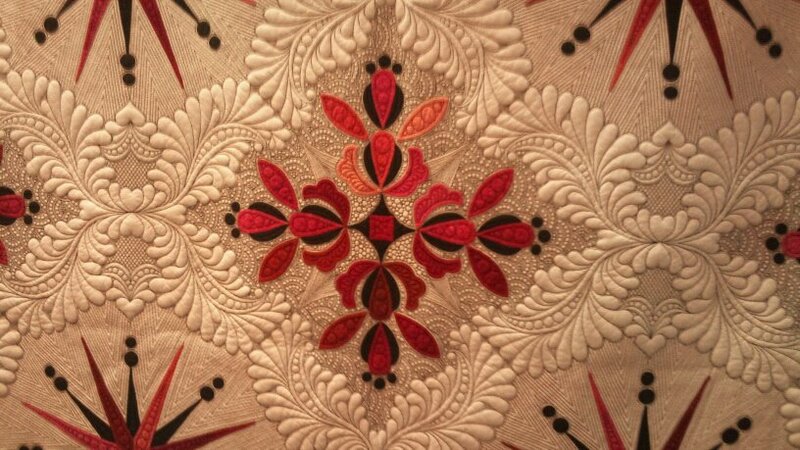 Sharon's quilts are absolutely amazing! She has been to my guild twice and You really can't appreciate how tiny her stitching is until you see it in person. Did she tell her about how she dunks all her threads into mineral oils and never has problems with stitching! I use that tip and keep a can of oil in my sewing room. so cool - she's coming to our guild later this fall. Also teaching a workshop - but I haven't decided whether to go yet or not. WOW! 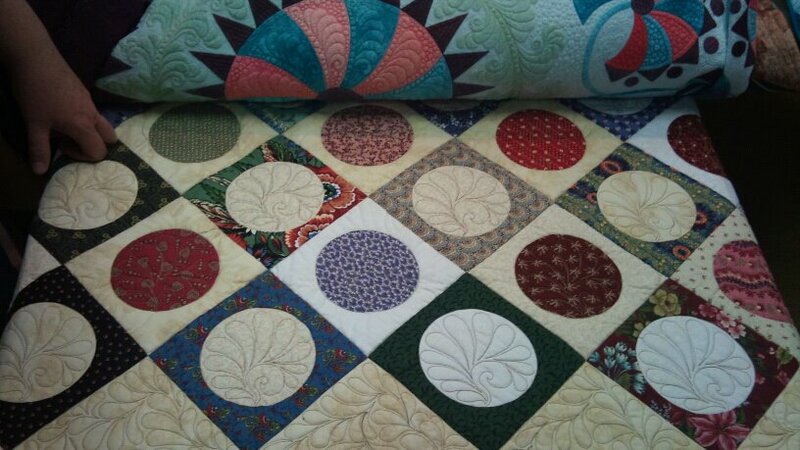 Was that All hand quilting?! She is a true gem - and so are you for showing us such delicate gorgeousness!! I sometimes think I should move down south just to be able to experience events like this ... then I remember I don't cope with *our* 'cold' weather up here, let alone anything down south for longer than a few weeks at a time!